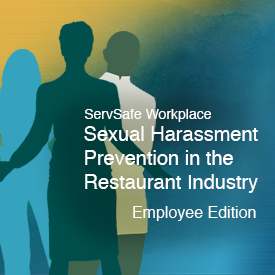 The Employee edition of Sexual Harassment Prevention for the Restaurant Industry is an interactive program designed specifically for employees working in food service. It provides employees with facts about what sexual harassment is (and isn’t), how to report it, and why a harassment-free workplace is every employee’s right. Restaurant-industry examples describe a variety of sexual harassment scenarios and the impact they can have on individuals and the work environment. Developed in compliance with EEOC guidelines, the program takes a frank and modern approach to addressing and preventing sexual harassment in the workplace. • Define sexual harassment and the two forms it can take. • Understand the harmful impact sexual harassment can have on victims, businesses, and those who harass. • Recognize conduct that’s appropriate, and not appropriate, for work. • Understand when and how to report sexual harassment.